One of the biggest reasons that I am drawn to these pictures of St. John the Baptist is because many of them feature Christ coming from a distance. I’ve featured this one already, which remains one of my favorite religious artworks of all time. But there are so many of them as well! While John the Baptist is in the forefront, he points to Christ, who is in the background. 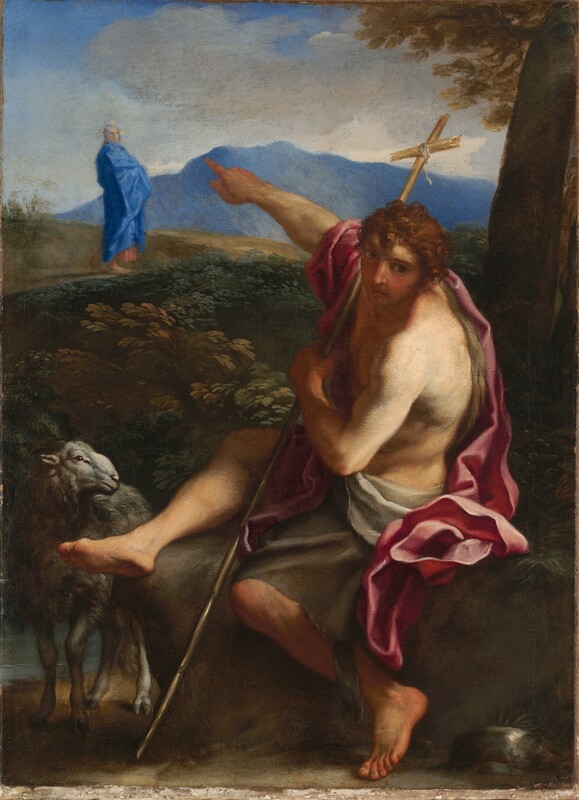 In this particular picture, he has a sheep right beside him, which is a common bit of imagery with St. John the Baptist. This is partly to emphasize his words that he said to his disciples when he saw Jesus coming from a distance: “This is the Lamb of God.” But it’s also to indicate that St. John the Baptist’s disciples became part of Jesus’s flock… and that we should join them as well. Saint John the Baptist Pointing to Christ in a Landscape, by Carlo Maratti, c. 1656. Fogg Art Museum, Cambridge, Massachusetts, United States. And these sorts of images are super important to me. For a long period in my life, Christ did seem to be in the distance. While I believed in God as creator, the fact that Jesus Christ came to save us seemed to be a dreamy and completely irrational to me. Everybody knew that superheroes didn’t exist. And here Jesus Christ was, God incarnate, here to save us all from the clutches of death, like the greatest superhero ever. How could this be real? I figured that maybe Jesus was just a good person and that His teachings were just pretty amazing so that maybe Christ was just a mouthpiece of God. But then I read the gospels and… no. Jesus didn’t claim to be anything of the sort. In fact, His very words indicate that He is God. Which made the nature of His sacrifice even more important. Why would He do this? Could it really be true that Jesus Christ really did come to save us all? Including me? Even when sometimes He seemed so far away? And so, when I look at these pictures, I am reminded that, yes, sometimes Christ does seem very far away. Really far away, in fact. While some of these artworks feature Jesus in the background, in others, St. John the Baptist is only pointing to a place far off in the distance and Jesus isn’t even visible. Yet, Jesus is there. And the way that we can encounter Jesus?